The King’s story, now in his own words. Jari Litmanen is finally looking back over a career spanning more than 20 years. Jari Litmanen (b. 1971) – known affectionately as “Litti” and “The King” – became Finland’s first international football superstar in 1995, when he won a cherished European Champions League winner’s medal in the Ajax Amsterdam No.10 shirt, and was placed 3rd in that year’s Ballon d’Or, the European Footballer of the Year award. At the end of 1995, Litmanen became the first-ever representative of a team sport to be crowned Finland’s Sports Personality of the Year. He has been voted Footballer of the Year in Finland on no fewer than nine occasions. Litmanen is also a former captain of the Finnish national side, and holds the record for the greatest number of international caps (137) and international goals scored (32). In 2013, the readers of Helsingin Sanomat, Finland’s largest daily, declared that Jari Litmanen was #1 on their list of “Living Finnish National Treasures”. Jari Litmanen’s career at the summit of the world’s most popular sport is internationally significant, and in Finnish terms quite unique, and many have told the tale before. But now, for the first time, Litmanen himself is opening up on what it has all meant to him. This lavishly illustrated volume describes Jari’s remarkable journey from the city of Lahti in Southern Finland to the world’s greatest footballing stages, from the muddy frozen pitches of the junior sides of local club Reipas to the final of the European Champions League and acclaim as one of the most feared attacking midfielders and playmakers of his generation. It charts his growth as a passionate and furiously dedicated teenager, the early years of his international career at Ajax, but also the later phases as an experienced and much-admired player with Barcelona, Liverpool, Hansa Rostock, Malmö FF, and Fulham. Litmanen explains how even today football rests at the very core of his everyday life: he still lives the beautiful game. 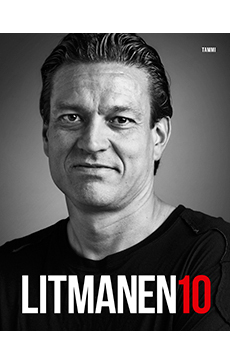 This is the first occasion where King Litmanen speaks frankly about the greatest successes of his career, the bitterest disappointments he has encountered, and the most important faces along the way, and how he has seen and experienced it all down the years. “I suppose I have a very Brazilian attitude towards football. The game is a big part of my persona and an important element in my life, on and off the field”, says Litmanen. No wonder this book has been so eagerly awaited. And now it is available to all. Sales figure in Finland has already exceeded 65.000 copies! See also the promotion video.